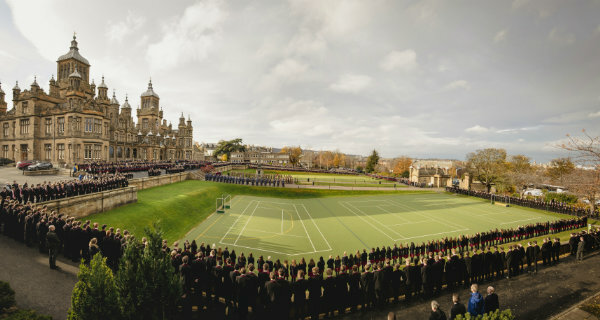 On Friday, 9 November 2018, over 2,300 children from the Upper Junior School, The Mary Erskine School and Stewart’s Melville College gathered at our War Memorial to observe a two-minute silence in Remembrance. This years’ service was particularly poignant as the country also marked the centenary of the Armistice on 11 November 1918, and the end of fighting in the First World War. Prior to our Remembrance Service, 440 crosses were planted by the Memorial in memory of the 440 Former Pupils who gave their lives in World War 1 and World War 2. Our Primary 7 pupils wrote the name of a fallen Former Pupil on each individual cross. Members of staff and pupils were also invited to share details of their own relatives’ experiences or service in WW1, WW2 or any other major conflict, and our War Memorial was lit up to show our support for the Scottish Poppy 'Lighting Up' Campaign. We are privileged to be able to welcome the wider ESMS community to join us in Remembrance each year, and a number visitors watched on in the School Grounds as our children gathered and wreaths were laid. Readings and prayers were also shared at The Dean at a commemoration for John Watson’s pupils who fell in both World Wars, before wreaths were laid by Former Pupils and parishioners. On Remembrance Sunday at 6.00am, 22 ESMS pipers then joined others around the world to play the traditional Scottish lament ‘Battle’s O’er’, remembering all those who fought and gave their lives and concluding our Armistice activities. Thank you to everyone who was able to take part in and support our Acts of Remembrance. Photos from our Remembrance Service are available to view on the ESMS Flickr channel.